Check out the G-Free Foodie Box review and giveaway by Sarah Bakes Gluten Free Treats! Well, look what I got in the mail! A box of gluten and dairy free goodies from the G-Free Foodie Box Club! I recently met KC, the founder of G-Free Foodie, at the GFAF Expo in San Francisco. She is super cool and asked if she could send a box my way. Ummmm, yes! We also talked about featuring some of my recipes on their fabulous website. If you haven’t been to G-Free Foodie, go now! So many great gluten free resources, recipes and their amazing box club. 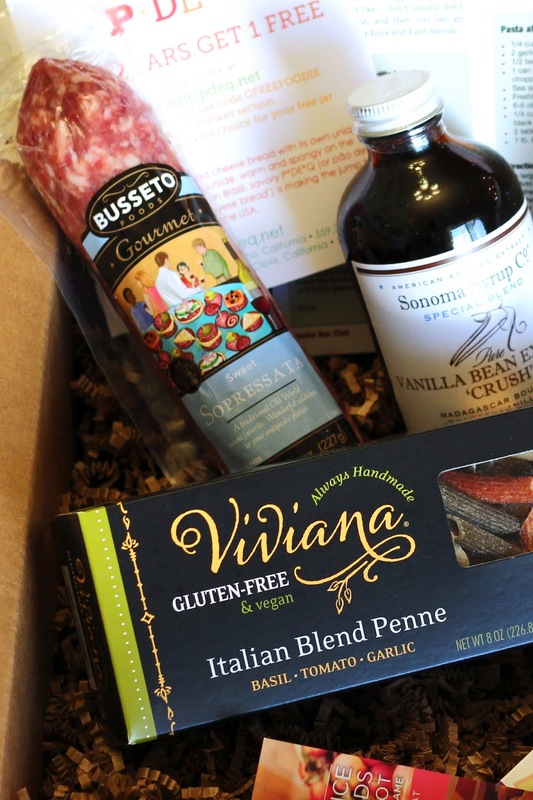 For $29, you can sign-up to receive a box of 5 gourmet, full-size gluten free products delivered right to your door. They also include recipes, coupons, samples and a fun gift too. With G-Free Foodie, you can only expect high-quality and super tasty products! It’s hard to find good, quality salami that is gluten and dairy free. This Sweet Sopressata from Bussetoo Foods has great flavor! There is a touch of wine in the salami, which I love. My kids also thought it was quite tasty. We all enjoyed the gluten free pasta from Viviana too. Beautiful, colorful penne. There are so many good and not so good gluten free pastas out there. I’m so happy to have found a handmade pasta that did not disappoint! 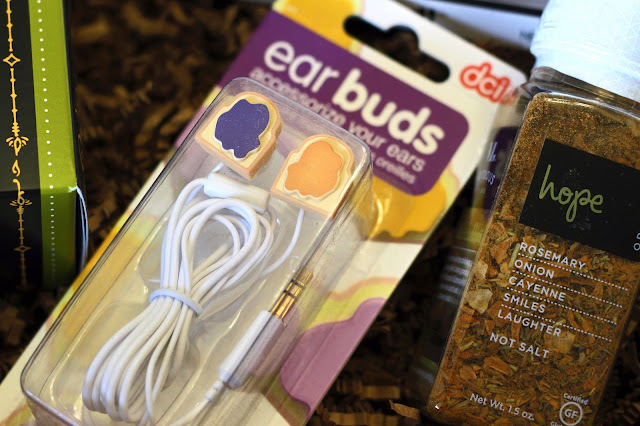 Aren’t these Peanut Butter and Jelly Earbuds the cutest? It’s gluten free bread, of course. My kids are going to love using this when they are on the tablet or mommy’s laptop (which is a rare privilege for them). So fun that they include a fun gift in your G-Free Foodie Box! I used this Hope Organic Spice Blend on the lovely Viviana pasta and it was a huge hit in our house. I added some leftover chicken, spinach, shredded zucchini and a little olive oil. A simple, flavorful one-pot meal for our family. These two items were my favorite of the bunch. This Vanilla Bean Extract from Sonoma Syrup Co is out of this world! Made with bourbon and tahitian vanilla beans, it has such a beautiful aroma. I used it in mybanana bread recipe and it took it to a whole new level. 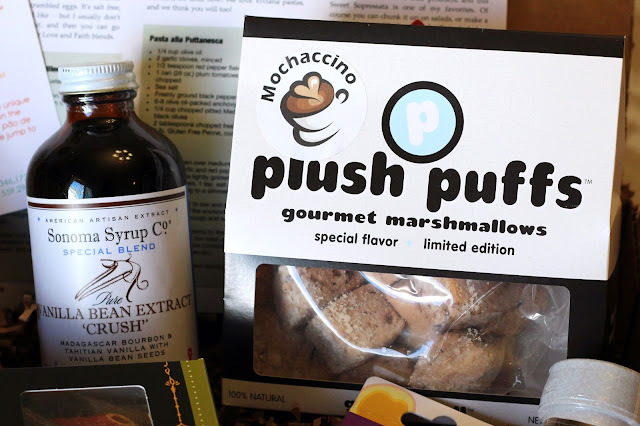 Let’s get down to business with these mochaccino gourmet marshmallows from Plush Puffs. Holy moly. I ate the entire bag…with no help. So light and fluffy. The mocha flavor is perfect. I can’t wait to try more of their marshmallows! Click here to go to Sarah Bakes Gluten Free Treats to enter the giveaway!! This entry was posted in G-Free Foodie Mommies, G-Free Foodie Product Reviews, Gluten Free Advice + Experts, What's in the G-Free Foodie Box? and tagged autism, autism diet, autism gluten free, autoimmune disease, celiac, celiac disease, celiac health, food allergies, g-free, G-Free Foodie, G-Free Foodie Product Reviews, gluten allergy, gluten free, gluten free baking, gluten free cooking, gluten free dining, gluten free food, gluten free mommy, gluten free parent, gluten free products, gluten free snacks, gluten intolerance. Bookmark the permalink. The GF basket looks great! I would like the vanilla, but truly the 1celiac person in our family…the 9 yr old would love the marshmallows! It is so hard to find anything Gluten Free in my area.. I would love to see a gluten free croissant! Those Plush Puffs marshmallows look divine!! For what I&apos;d like to see..
I&apos;d love to be able to find gluten free croutons that had a good crunch and texture to them. BONUS: flavored with spices ones! Just diagnosed with Celiac. Just wanting to see & try all the gluten free items. Everything looks good! I would love any of the GF/dairy free items!! They all sound delish!! It all looks really good! I just signed up to receive the box each month and I can&apos;t wait to see wht goodies I get. I was wondering when do you ship out each month and will I get an email saying that my member ship went through? Thanks!